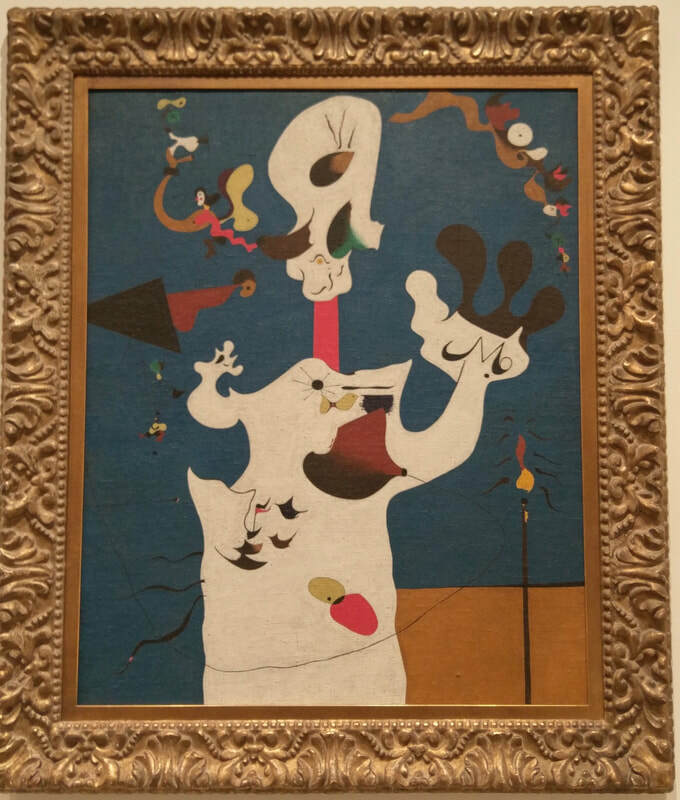 “The Potato,” a 1928 surrealistic oil on canvas by Spanish artist Joan Miró, illustrating the artist’s imaginary memories of his childhood, is on exhibit at the Metropolitan Museum of Art in Manhattan. At first glance, the painting seems like an unsolved puzzle, with its juxtaposition of organic forms coming together to create something bigger and larger. But if observed closely, one can see that this is a human figure. Indeed, the figure painted white is a woman stretching her arms wide in front of her as she is looking up. She is surrounded by a blue sky, and a brown field of potatoes. To create the surrealism in “The Potato,” Miró started by drawing a recognizable subject, a woman, and transformed her into a biomorphic, humanoid form using whimsical colors, shapes, and forms. It represents Miró’s play on imagination combined with the memories of his childhood home, using the surrounding village, sea, and mountains as reference. In the painting, the female form is semi-abstract with an organic large head, thin red neck, and two different shaped hands that seem to be missing fingers. There is an indication of a face with two black eyes and a small nose. The object on her forehead is an actual potato, hence the title, “The Potato.” The woman is surrounded by earthy elfin figures of different shapes and sizes, a red and yellow butterfly woman, stairs, and a fishing pole. Miró was born in 1893 in the province of Catalonia, Barcelona, Spain. He studied art in prestigious Barcelona schools since the age of seven. But as an adult, he also attended business school, until he suffered a mental breakdown that forced him to abandon business school and devote himself entire to art. During his youth, Miró was deeply influenced by the landscapes of Barcelona, its artistic heritage, and by the cubist and surrealist works often exhibited there. At the age of 22, Miró went to Paris, where he met Pablo Picasso and associated himself with other Surrealist artists. His career skyrocketed after his first solo Surrealist exhibition at the Galerie Pierre, in Paris, in 1925. He died in Majorca, Spain in 1983 at the age of 90. 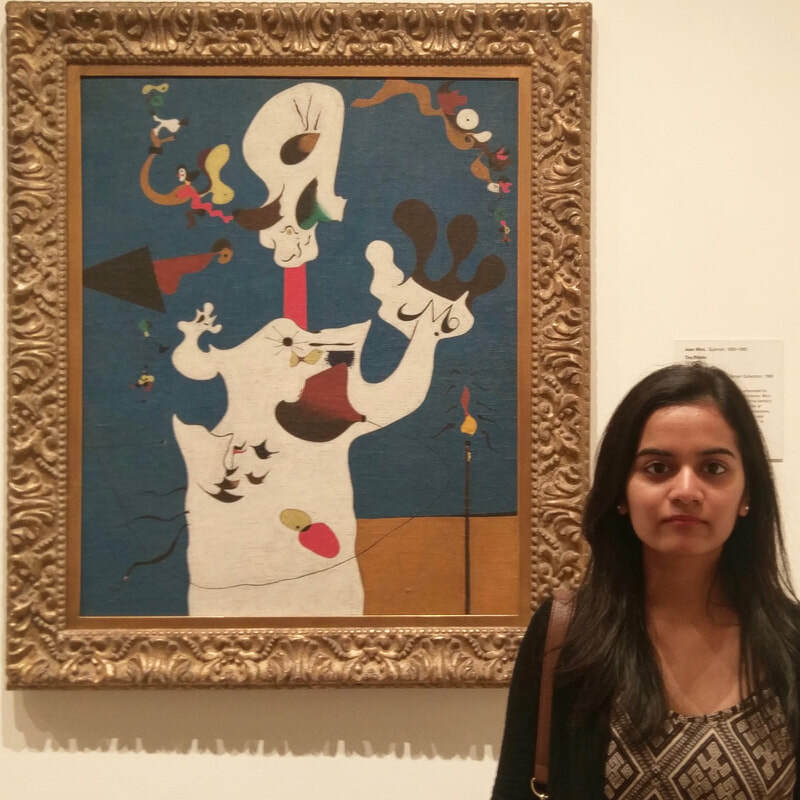 Today, Miró is known as one of the most renowned artists associated with French Surrealism. His works have been exhibited all over the world. This painting is in the Modern and Contemporary Art Gallery (906) and part of the permanent collection at the Metropolitan Museum of Art, 1000 Fifth Avenue, in Manhattan. The Met was founded in 1870, opened its doors on February 20, 1872 and since then, has become one of the most visited museums in the world. It has three locations: The Met Fifth Ave, the Met Breuer, and the Met Cloisters.